I have to say this book has made dinners at our house so much easier. 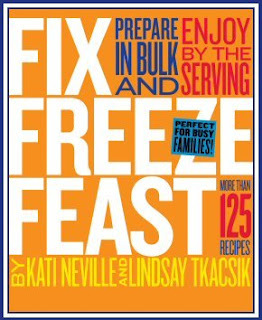 The recipes are simple and you can have several meals in the freezer in no time. It is really nice to thaw the entree in the fridge the night before and then pop it in the oven when you get home from work. Some of the recipes like the Margarita Chops and the Manicotti were not spectacular, but worth having again. The Honey Glazed Thighs and the Swimming Rama will probably become part of our regular rotation. The only drawback I can see at this point is the use of ziploc bags. I am really trying to get away from using them, but they are pretty much a necessity when utilizing this program. You could use reusable containers, but you would have to have a ton of them. Plus storing the reusable containers takes up so much room. I will have to brainstorm and see if I can come up with any solutions.